If you don't know what NetHack and Slash'EM are, go here and here posthaste for more information. If you do know what NetHack is, but think that the use of any sort of graphical 'tiles' with the game is an evil perverted abomination, you may as well turn back now. Everything on this page was created for Windows-based 'vanilla' versions of Nethack and Slash'EM. If you are using any thing that patches in new items, the set won't work. Linux users, see special section below. I love NetHack and its offshoot SlashEM. They are wonderful games with endless replay value, and the price can't be beat. This is not a more elaborate and detailed tile set, ala AllegroHack or Falcon's Eye. Just the opposite; I've pared everything down even more to a tile size of 20 pixels high by 10 pixels wide, while using as small a palette of colors as possible, and whenever possible, incorporating a version of the original ASCII character into each tile. It's been reported to me that that some NetHackers out have found the result to be a useful cross between the default WinHack tiles and the original ASCII version. With the GTS copied into place, and the proper options added to your 'defaults.nh' file, a game of WinHack or Slash'EM should now display an entire level of the dungeon on your screen without any (serious) warping of the tiles, while still offering more information than ASCII about everything that you are seeing, stealing and slaughtering. I've tried to keep the eyestrain down to a minimum as well. with a 'tusk'. I've included more explicit monster spoilers at the bottom of this page, for anyone who may be interested. Inanimate objects are a somewhat different story. If it has been at all possible, I've again worked the original ASCII shape into the new tile: Wands are a variety of different colors, but they are all still roughly '/' shaped. Spellbooks have a '+' on their cover instead of the 's' found in the default tiles. Scrolls are labeled with a '?'. Rings are big '=' signs. Amulets are " symbols. Most of the traps in the game are marked with a red '^', and so forth. (One of the major changes with version 2.0 is that I went with an explicit "[" shape for much of the armor.) However, in many cases it just wasn't possible to use the ASCII as a base, and so the object simply looks like.. the object in question. Hopefully. This is particularly the case with hardware and food tiles. SPECIAL NOTE: Due to the thinness of my tiles I made oil and magic lamps look like old-fashioned kerosene lamps, instead of something from the Arabian Nights. SPECIAL NOTE #2: Because these tiles are asymmetrical, when shooting wands and missile weapons at an angle you need to make extra sure that your intended target is in fact in a straight line with you. 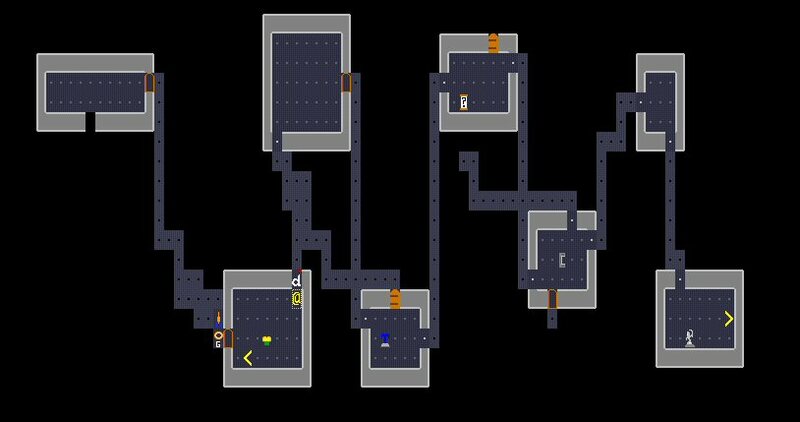 If you wish to see a screenshot of what a game level looks like while using the NetHack set, click here. The full-sized scene shows a novice heroine and her little dog about to face a goblin on dungeon level number one. The actual game will not be as blurry as this .jpg reproduction. If you wish to try the GTS tileset, chose your variation and follow the instructions. BE SURE AND GET THE FILE FROM THE SECTION WITH CORRESPONDS WITH THE VARIATION YOU ARE CURRENTLY PLAYING, OR IT WILL NOT WORK! Save this .bmp file into the NetHack game directory on your computer. Save this .bmp file into the Slash'EM game directory on your computer. Whichever of the four files you use, be sure there is only one line in 'defaults.nh' which lists the described parameters; otherwise you will get an error message when the game starts. If you change the name of the set file when you save it to your system, you'll need to use the new name in the 'defaults.nh' line. Start up the game with the GTS in place. If you see a jumbled mess, you downloaded the set for the wrong game. If it works, you will want to try the "Fit To Sceen" option under "Map", and see if everything looks better with that option on or off. I had less luck trying it with my local ~/.nethack/nethackrc.qt file, as the one in /etc/nethack seems to override the tileset option. I ended up just deleting the ~/.nethack/nethackrc.qt file." Thanks again to the writer for the info; if anyone else tries it, let me know how well it works! I officially give my permission to post the relevant .bmp(s) elsewhere, as long as I get all the credit, fame and glory. (Muhahaha!) At the moment, this page is the only one offering 'official' updates to the set. If you want to see the pre-2.0 version of this page, click here. No promises any of the links still work. Another Hacker made an alternate small-tile set that used, with permission, some of my ideas. You can check it out here. I stole back a couple of ideas for some of my own updates. And a couple of 'nethack fonts', for X11 and xterm users. My tile set is (or was) included in the noeGNUd project. A revamped version of Falcon's Eye is Vulture's Eye. A collection of various NetHack and Slash'EM tilesets. Shriekers look like a mushroom, instead of being a capital F like all the other fungi. Except for skeletons and ghouls, which are still Z-shaped, the classes of mummies and zombies use the letter and size of the reanimated creature in question, only changed to a 'bandaged' or 'decayed' color scheme. Incubi and succubi are depicted by the appropriate 'male' or 'female' symbol. All other demons use the '&' symbol, however distorted and disguised it may be in some cases. NetHack and Slash'EM are copyrights of those fine people who make them. J. R. R. Tolkien first came up with the idea of Mumakil.